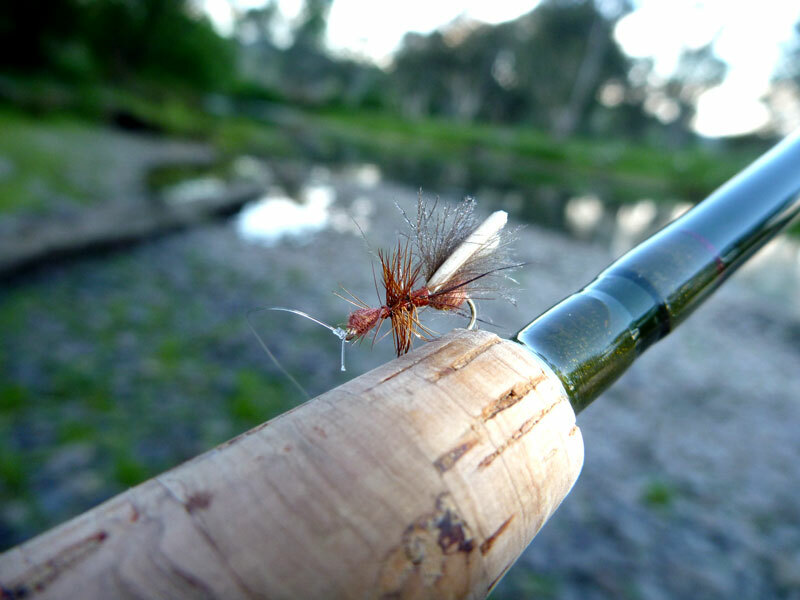 Read on for a basic month by month guide of what to expect when fly fishing the Goulburn River over the course of a season. Unless the lake is very full i.e. >80% with spring rain forecast for the coming months, the Goulburn will be running at a very low level (i.e. minimum riparian flow of 400 ML/D (Megalitres a day with a megalitre being a million litres; the equivalent of one Olympic swimming pool of water). This is so that Goulburn Murray Water (GMW) can capture as much water as possible, to later be delivered to farmers when things are drier in late spring and throughout the summer. Lake Eildon is the source of much of central Victoria’s irrigation water, and the plan is to let it fill throughout the months from May-November, and then use this stored water once the spring rains cease and the demand from farmer’s for irrigation releases increase. Typically most of our rain comes in August/September/October. Heavy spring rains falling onto a soaked catchment can see up to 40,000 ML/D coming into the lake from its feeder streams i.e. the Big, Upper Goulburn, Jamieson, Delatite and Howqua Rivers. Many people mistakenly believe that snow melt plays a major role in the amount of runoff and the level of the lake each spring. This is incorrect. Heavy spring rain, at weekly or fortnightly intervals is the key to seeing the lake fill. It is at this time of year that releases of water into the Goulburn River below Lake Eildon, are all but stopped. The fishing in this month is a mixture of wet/nymph and dry; about 75:25 subsurface to surface. Often this is the only clear water in the state, as the natural flowing rivers are in flood and are way too cold (water temperatures). The minimum flows of the Goulburn provide for fishable conditions and water releases from deep in lake Eildon ensure clear/warmer water is to be found (when compared with naturally flowing streams of the region). Clear water can almost be guaranteed between the Eildon and Thornton, but as you move further downstream, more gullies and gutters enter the river and cause some discoloration as they join the main flows. Some increase in clarity can be found downstream of the Rubicon confluence at these times, but the water in that section is much colder and therefore less likely to offer up good hatches or very active fish. Either way, it can be the savior when the Goulburn is running low and dirty from Eildon to Thornton on those rare events of heavy rain with low water releases and a low lake/pondage. The fish are very wary in the low, clear flows. A lot of the browns will line the inside of river bends, feeding in ridiculously shallow water and sitting dead still, waiting for aquatic insects and baitfish to show themselves. This is very tough fishing. As a result blind fishing with nymphs is the best option in the clearer water. If the water is slightly discoloured, a wet fly like a woolly bugger will do well. Dry flies should be kept small in keeping with the type of insects likely to be hatching; namely midges and small mayfly. Evening rises are usually slow although there will be surprises as some larger duns will pop off some nights, much to the frustration of the fly fisher who only has a sinking line and streamer on! Most years we see hatches of quite large duns as early as August 20 and by the opening of the trout season you can bet that you will encounter them on evening. I cannot recall a trout opening where these large, pale duns haven’t made an appearance. 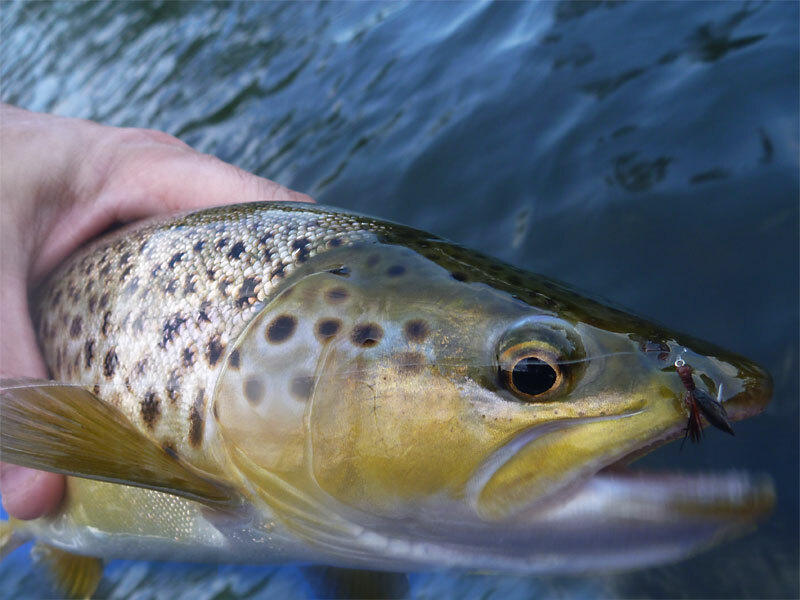 As the month progresses, the hatches will dramatically increase in intensity, with caddis showing up in greater numbers and numerous other mayflies also appearing in larger concentrations as we near the end of the month. The river can remain at 400 ML/D for the entire month of October if the weather is cool and we are getting regular rain i.e. normal conditions. This seasonal weather will ensure that there is no demand for irrigation and if the farmers are not demanding it (i.e. paying for it), the water will not be released. In a drier year the need to sustain optimal growth in the farming communities a long way down stream will see rises of up to 3,000 ML/D. Generally speaking you can expect to find the river between 400 and 2000 ML/D. By now water temps have increased and the first big hatches have started. My diaries show it as happening most often sometime between October 1 and 7. Huge hatches of caddis will persist throughout the day and duns will make an appearance on nightfall. The fishing throughout the day on caddis pupa patterns can be ridiculously good. 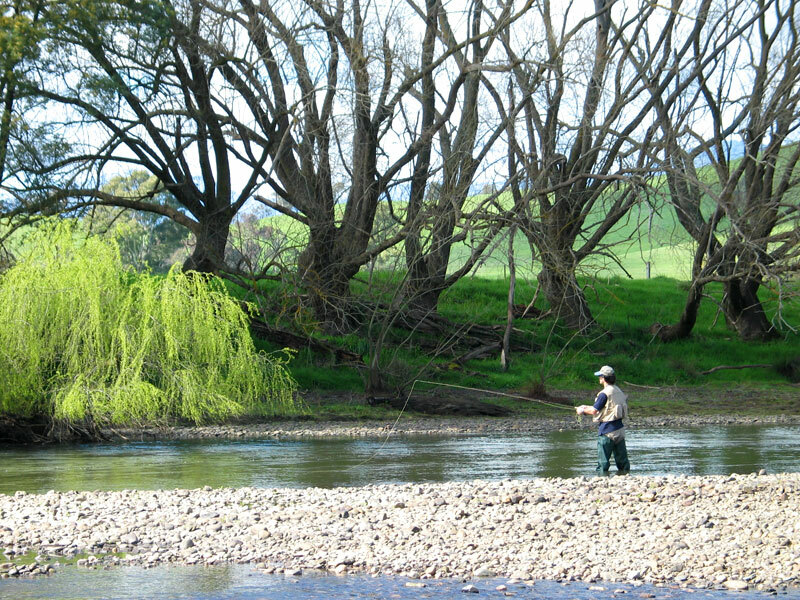 Twenty fish days are relatively common and the river is often in perfect condition; wade-able with the fish actively feeding from the surface. As the month progresses we start to see larger insects and more of them. Grannoms begin to appear in great numbers, crash landing on the water’s surface as they make their way upstream. Caenids begin to hatch in huge clouds and this will continue for several months. These hatches are by far the biggest that I have ever seen, as good as any we’ve encountered the world over, with literally millions drifting by all morning from first light until about 8 or 9am, sometimes much later. Think long, fine leaders, tiny flies and picky fish. Catching them is more about presentation than imitation. Getting in sync with the fish and putting your fly across the fish’s nose at the exact right moment is key. The best days occur on a river running <1500 MLD after a cold, clear sky night. Expect amazing dry fly fishing when this happens. By month’s end the fishing is as good as you will find anywhere. First light caenids. All day caddis with overlapping hatches of multiple species of mayfly duns, caddis and spent spinners as well. Just glorious dry fly fishing. By now we usually have slightly higher water levels as the demand for irrigation increases and this is welcomed as the fish are getting slightly edgy after about six months of low water conditions. Levels of between 1,000 and 3,000 bring on some of the best fishing of the season. The intensity of the hatches is building to a crescendo that will occur somewhere between late November and Christmas. Absolutely everything is coming off. Caenids at first light for a few hours. Then caddis will hatch through the day, as will several species of mayfly. Beetles are starting to become important and evenings will be a smorgasbord of duns, spinners, caddis, stoneflies, grannoms in every size shape and colour. Being prepared for all eventualities is advisable! On the thundery and/or humid afternoons, termites hatch in great numbers in the forests to the south east of us and will end up on the Goulburn; capturing the full attention of the trout. A good imitation is worth its weight in gold, and you will be able to sell a working fly to your mate for at least 20 bucks a pop. Some great fish are caught during this hatch each season. Some nights the Kossie Duns will hatch out and make grown men weep. It is ‘THE HATCH’. The biggest mayfly that we have here in Australia. Make no mistake; this is one of the highlights of the year. Very big duns appear at last light with little indication/warning, and the fish go nuts for about twenty minutes. 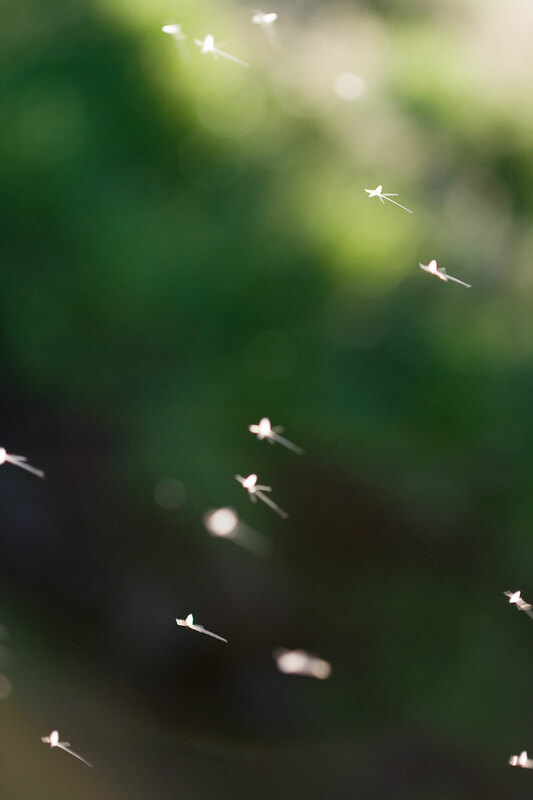 A must experience event with #8-10 mayflies drifting down in the last light. I fish #6’s ‘over the top’ of the hatch and do very well with this approach as the light fades in the western sky. Summer has now kicked in and the days are long and hot. The river will be anywhere between 2,000 and 5,000 ML/D but usually around the 4,000 ML/D mark. Backwater fishing is now starting to really come into its own. Fish will move out of the main river flow to seek out more favourable conditions in the slower flowing edges. The bigger fish take up the best positions, often less than a foot off the bank, and defend them from all-comers. This is a great time to be fishing. The biggest insects of the year have been hatching for about a week, possibly 10-14 days, and the fishing can be outrageous. If you catch it just right, those first days of the cicada hatch are my favourite of the year. It’s almost like the fish are drunk and just eat everything you throw at them. Not long after the small hoppers show up and start falling onto the water. Green is the colour of choice for those seeking to imitate them and sizes should be between 12-14. Beetles are just about peaking in numbers around now, and they are also falling into the water, especially on warm northerly wind days when they tend to get on the wing. As a result, the fishing of terrestrials starts to make up the bulk of the daytime opportunities. Fish are in close and naturally seeing lots of these insects dropping in from the overhanging banks. Any terrestrials that end up drifting in the main river tend to end up being funnelled into the backwaters, and in turn, to the fish. Stalking the edges carefully becomes the key to success and those skilled at it will catch many more fish than the average angler. 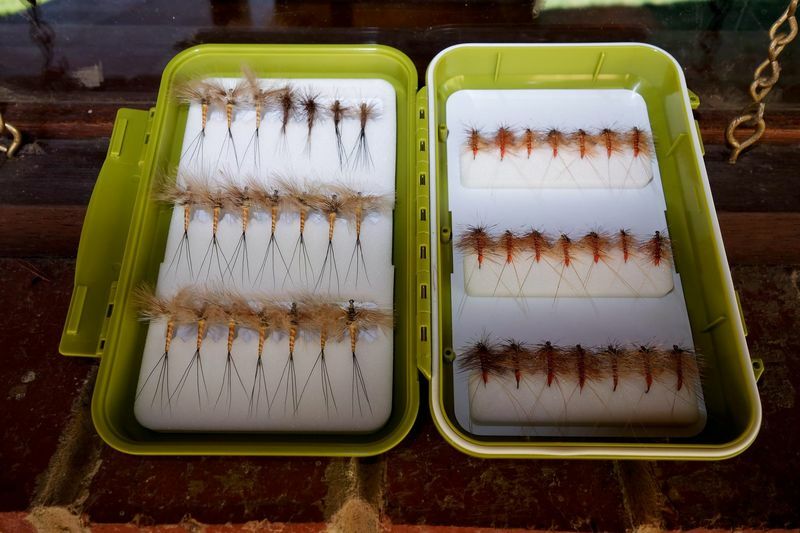 As the month progresses the hoppers will get bigger and so should your flies. But it’s not all about terrestrials in December. There are a number of good hatches as well. Caenids will remain a focal point for those willing to get up early. If the river is not too high, it can be epic. The rusty duns will start showing up each night in ever increasing numbers. Many caddisflies will also be important but the larger volumes of water will often disguise the presence of small, dull coloured bugs. So look carefully. It is about this time that we see, what has arguably become the most important source of protein for our trout. The willow grub. 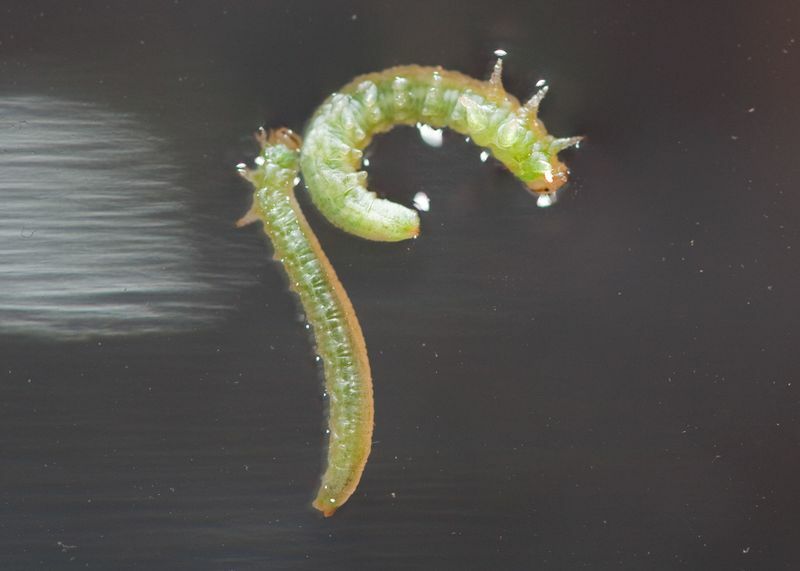 The larva of the Sawfly is without a doubt the best thing to happen for the fish of the Goulburn that I can recall. What’s even better is that they appear in high-summer, just when the hatches of aquatic insects are decreasing in intensity, giving the trout the most abundant and easy to capture food source of the year, when they wouldn’t otherwise be coming to the surface as often. These grubs fall from trees all day long, and the fish will rise without pause, for hours at a time. It is nothing to walk onto the river at 9am and fish willow grubs to rising fish until 9pm. The fish go crazy. Reacting to each and every plop on the water, knowing that an easy meal has just arrived and is unable to escape. By the end of the month we are noticing more and more large fish occupying the prime lies and all fish are putting on substantial amounts of weight. The fishing becomes so easy (most of the time!) that I pretty much only take a camera and telephoto lens out and leave the rod at home. This is one of our favourite months. 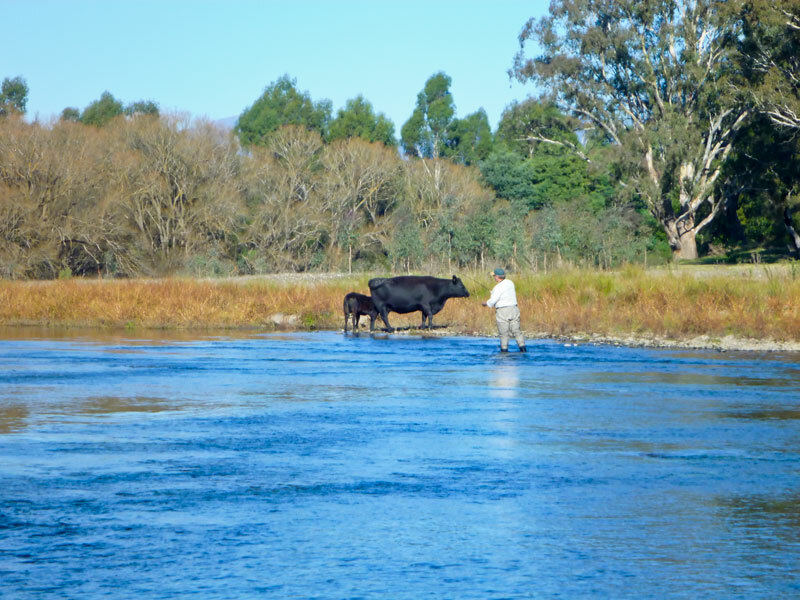 Not just because the Goulburn is fishing amazingly, but because all of the natural streams (read undammed rivers) are at perfect levels, there is an abundance of fishing options. And all with dry flies! As logic would dictate, a drop in the height of the other rivers, means that the warmer, drier weather is starting to have an effect. As a result the demand for irrigation increases from the farmers located down river of lake Eildon. When this happens you can expect water flows to be increased, with levels between 4,000 and 8,000 to be expected. Backwater fishing becomes all important. If the level is at the lower end of the spectrum there can be brilliant hatches. When it is up near 8,000 ML/D, backwaters are the only real option, with evenings spent on smaller feeder rivers, or hunting hatches by floating in the drift boat. 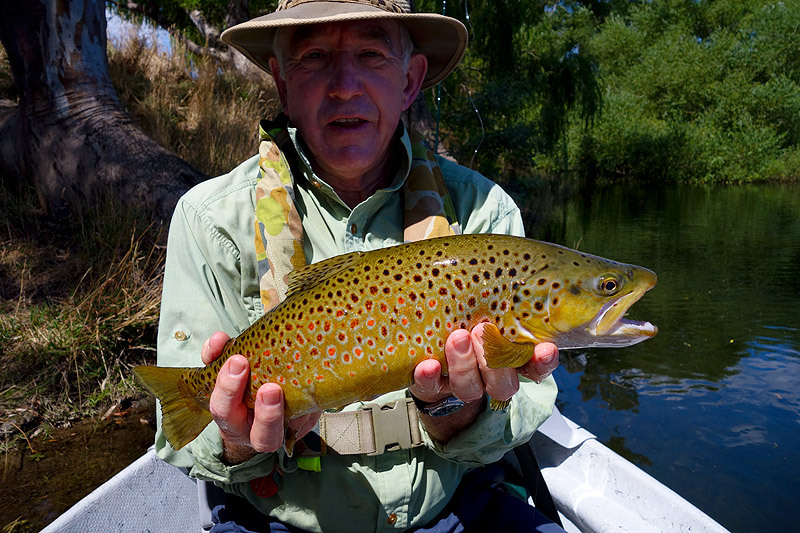 The willow grub is still the most important food source for the fish of the Goulburn and this is often the best month for fishing them. Fish rise all day and put on a tremendous amount of condition very quickly. Many backwater specialists will appear in the shop day after day, stocking up on willow grub patterns that may only have a return rate of 30% i.e. one fish landed out of every three hooked due to bust-off’s in snags and willow trees! This is the most exciting fishing of the season with fish of 3-5lb being hooked at 1-2 rod lengths. Hopper fishing with larger flies averaging around a #10 is now the way to go. The fish are used to big terrestrials crashing into the water, and they hit them with real vigour. Blind searching the edges with a hopper or hopper/nymph combo is exciting, if not a little draining in the heat. 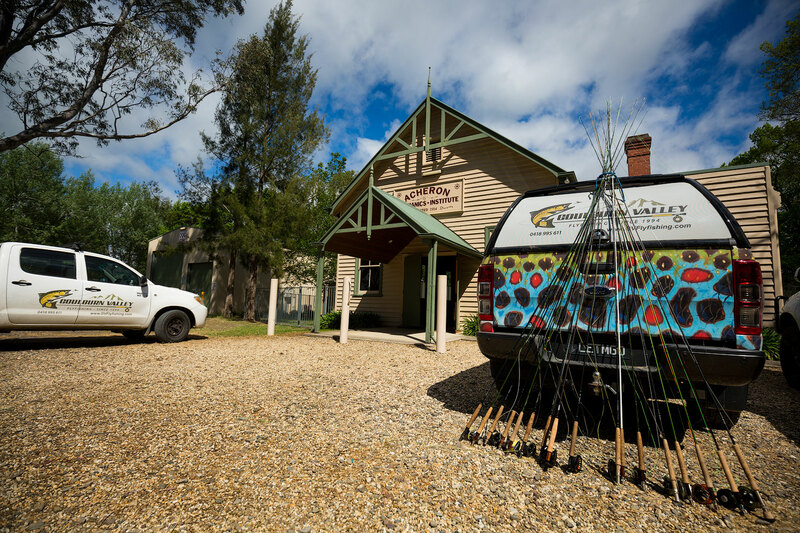 We try to break up hopper sessions into smaller bites of a few hours with a break back in the fly fishing centre in between. Taking time to cool down and escape the heat of the day is important at this time of year. Cicadas are often the fly of choice and account for numerous big fish all January long. Having a drift boat with a skilled guide on the oars opens up the entire river. 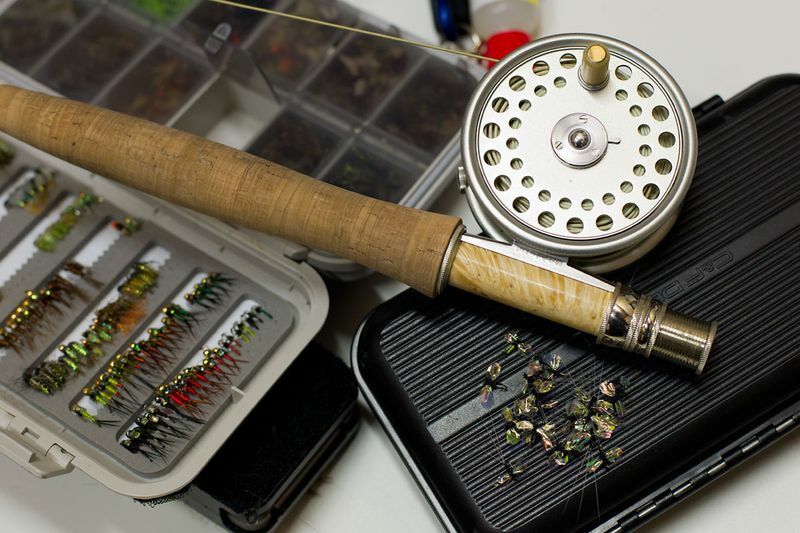 Beetles and small soft hackle wets are deadly in the backwaters and parachute duns will often take a fussy fish that refuses the beetle or hopper. By now there are some trophy browns to be found in close, and the best backwaters are nearly always occupied by a hefty fish. On most days you should be able to work the edges carefully and fish to at least a dozen sighted, and often rising fish. These are good times. This is not to say that evenings are a dead loss. Often the best backwaters are worth fishing just on last light. If you find a good fish in along the edge through the day and spook it, you can always head back to it with the confidence that it will show up just on dusk. Long flat pools offer some excellent spent spinner fishing in the last 120 minutes of the day for those on a drift boat. 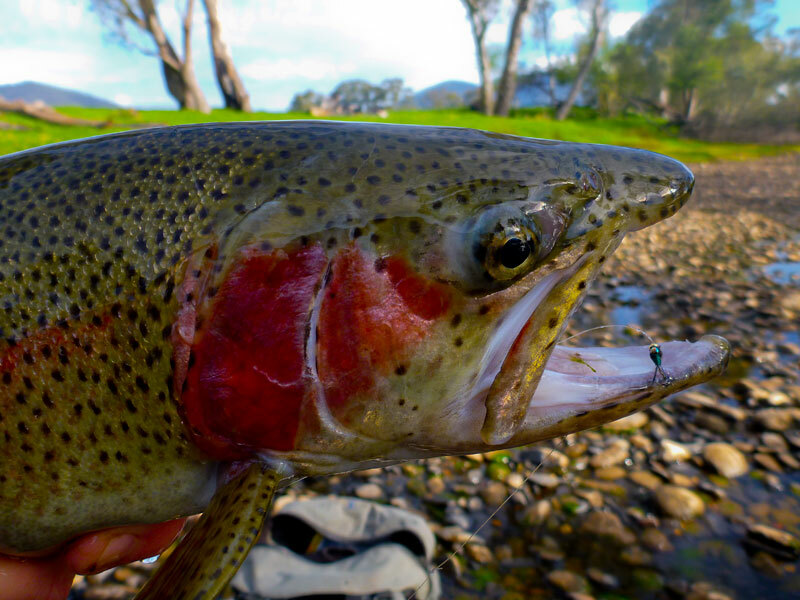 This is when the unique nature of a bottom release tailwater river like the Goulburn is most evident. Just as the Goulburn runs low and warm when the other rivers around it are running high and cold, it now runs high and cold as the others are getting low and warm! Great for the trout considering daytime temperatures will reach 40 degrees Celsius at times. 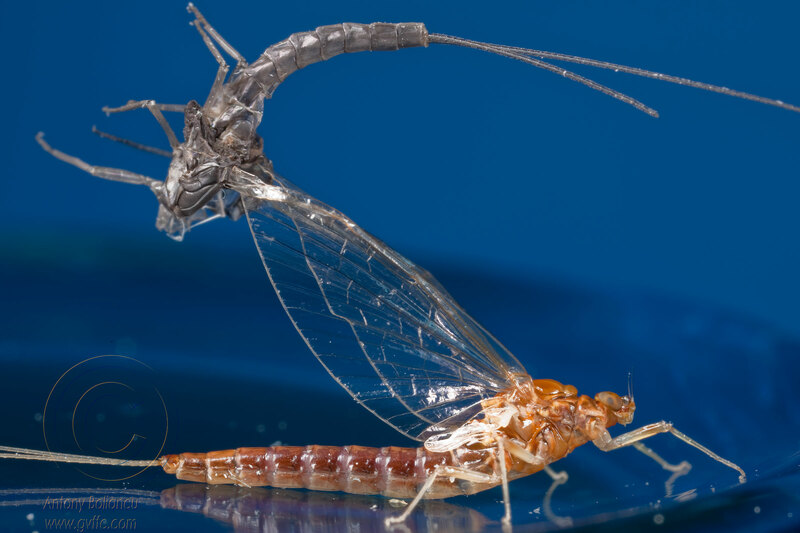 River levels severely hinder hatches of aquatic insects. Releases of between 6,000 and 10,000 MLD see the hatches wind back considerably. The focus is now not only on backwaters but also the large areas inundated off the river proper; the billabongs and lagoons. Some of these areas extend back a mile into adjoining farmland and unbeknownst to most fisherman, the fish cruise these areas slowly and silently. Most of these fish go unmolested for the entire summer. The section from Alexandra downstream is particularly good for this sort of fishing. The willow grubbing is peaking but populations may vary depending on the amount of rain we have received and the temperatures, both daytime and night-time. The European Wasps also start to show up in large numbers at about this time, and they have had a huge impact on the willow grub population in recent years. Some years will see all the willows denuded of vegetation and grub numbers thinning out pending a re-shoot of the willow trees. Other years, for example in Feb 2013, the trees will mostly be in prime condition and covered in grubs right throughout this month. Great fishing can be expected and there will be some very large fish caught. Big hoppers and attractors like the stimulator and chernobyl ant work well, as the fish are now used to everything from cicadas to grasshoppers to beetles to spiders going into the river. Sighted fish should be fished to with care, blind fishing the edges should be with bigger rubber legged flies. The month of March is not really autumn in the Goulburn Valley. Although there is a distinct trend of cooler evenings, the endless procession of stable high pressure systems, sees blue skies with a few scorchers thrown in for good measure. Hot weather will often persist until early April. While river levels will come down quite a bit, we will still regularly see 3,500 to 5,000 ML/D being released. This will signal a return of the recently MIA hatches with duns and caddis showing up again, much to the pleasure us fly fishers. 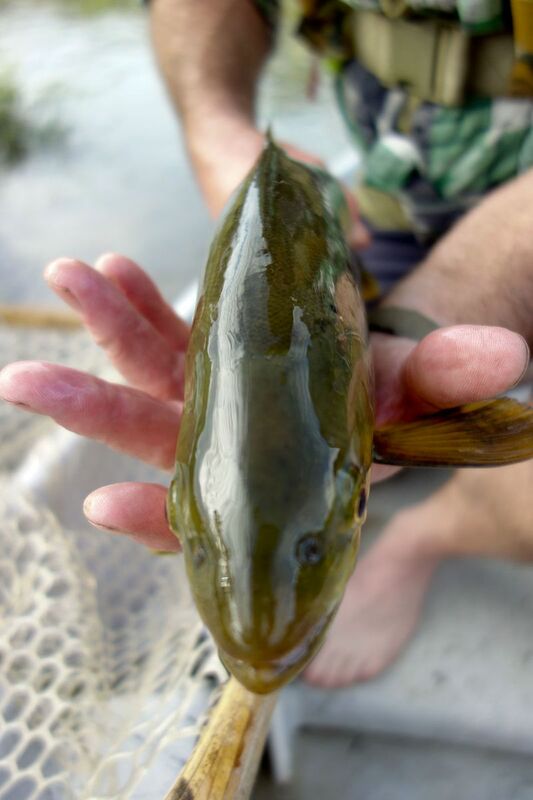 Willow grubbers are voracious and you often catch the same fish immediately after dropping it. The second fly in this one was from a break-off the previous day. Backwaters are still fishing with many more beginning to fish well again, now that the full irrigation releases of February have subsided. Fish make their way back from the now drying billabongs and take up positions in the reverses and backwaters. Hoppers and beetles are still working although duns and caddis will catch a fair percentage of the fish on offer. Don’t discount cicadas, crickets and the humble soldier beetle. All of these critters can be very important at this time of year. Willow grubs will taper off at some stage this month. While they are usually still going strong up on the Tumut River, the first of our cold nights in late March will knock most of our grubs on the head. As the river levels fall away, the fish once again take up position on current seams and a return to normal blind searching techniques will bring results. As the month progresses, the water levels will decrease, as will the air temperatures, and this combination of factors will trigger more hatching insects. April can be one of the best months of the season. By now the river is somewhere between (1,000 and 3,000) and terrestrials are but a memory. The aquatic insects now take centre stage. Rusty duns can hatch in very large numbers and the last hurrah of the caddis is not to be missed. As the flow rate decreases we usually see an associated increase in water temperatures which triggers hatch activity. Insects are again getting smaller in size. The fish are biologically programmed to feed heavily in anticipation of spawning, which will occur in the coming months. 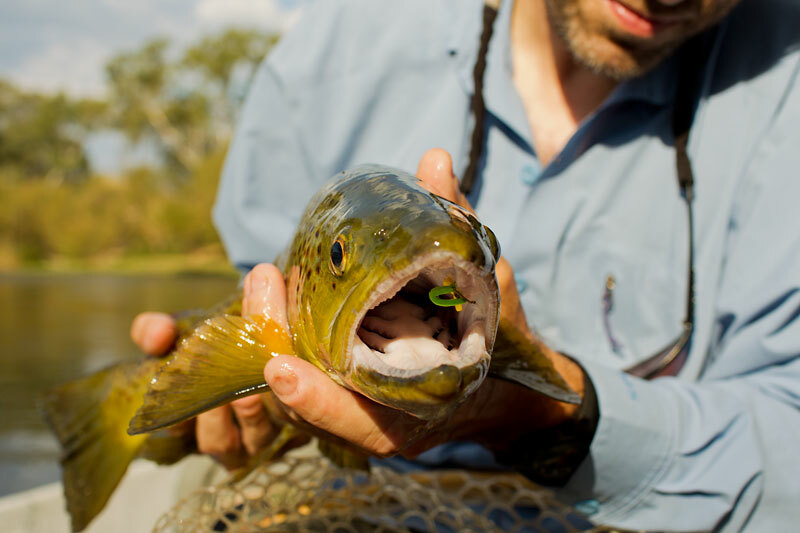 As a result, hatches are usually met with solid rises from the trout. Small parachute duns, especially in rust, grey or olive will work very well. Emergers in dirty browns will also do well and the humble stick caddis suspended below a dry will at times catch a great number of fish in along the edges. Particularly following a substantial drop in river height. Having said all that about smaller bugs, I should throw in nature’s curve ball. You will get tremendous hatches of kossies on last light most evenings. It might only last 10 minutes but they will appear and the bigger browns, who may have held on the bottom, seemingly not feeding all day will rise to them. Spinner falls of this mayfly will occur any time from 5pm onwards, and large rusty spinners should be carried for just such an event. Later in the month the river will start to drop rapidly. Days get much shorter and overnight frosts or early morning fogs become a regular fixture. Autumn proper is on the way. River drops at this time should be met with glee. Weed beds that have grown and flourished over recent months will see mass evacuations of bugs. Sometimes they will hatch as a result. More often they just move house. The good thing is each significant drop in level will cause a mass migrations of insects, which results in many ending up being caught in the drift. Midge larva can be deadly fished under an indicator at these times. Wink, wink. There is a period that occurs every year from about the third week in April until mid-late May that is absolutely glorious. 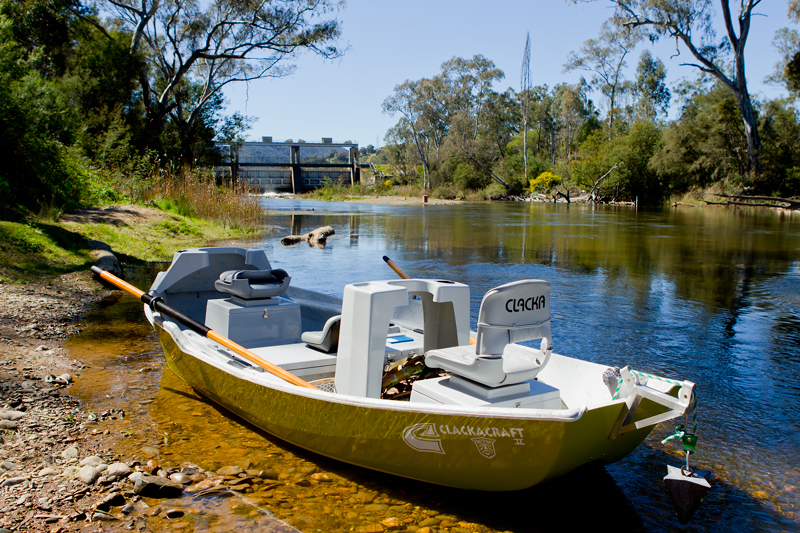 Sometimes it goes for three weeks sometimes four or five, but it is the most pleasant time of the year and brings about some of the most enjoyable fishing you will ever experience on the Goulburn. Cool, crisp mornings give way to the bluest skies imaginable, and days of light wind and rising fish. The river usually comes crashing down to the minimum flows (riparian flow 400 ML/D) and stay this way throughout the winter/early spring period as rainfall is captured in Lake Eildon for the following summer’s irrigation releases. This is the time of midges, blue wing olives and light gear. Careful wading and approaches to feeding fish are a must. Fish will often rise from about 8.30 am throughout the day. On the foggy mornings the start is just a bit later at around 11am, but still the good fishing remains. My most pleasant memories of fishing on the Goulburn are in this time period with the weather as close to perfect as it gets. Sometime late in the month the weather changes significantly, although often the first major rain events are not until at least mid-June. The days are shortened and the hatch and rise occurs in the middle of the day with less emphasis on the last hour or so. About the end of the month the first browns start to spawn and should be left alone. Catching these fish is not sporting and requires little to no skill. Please leave fish that are in spawn mode to their efforts. There are plenty of (not yet spawning) fish still actively feeding, with only the early run fish involved this at this time of the season. This usually occurs in the last 7-10 days of May. The one surprise that we sometimes encounter is that the kossies continue to hatch on last light right throughout this month and into June. In May-June 2013, we saw Kossies hatching most nights on dusk, long after we would have expected them to have stopped. 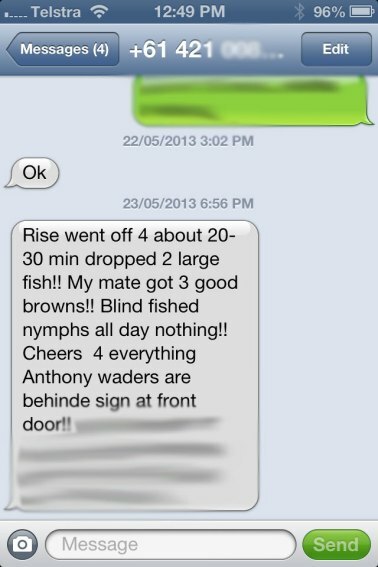 This is worth keeping in the memory bank as most of us are not expecting to be fishing # 8 dry flies at the end of May. I hope that this helps you to get a bit more of an overview of what goes on here on the Goulburn River. While this write up is pretty comprehensive, there is a lot I didn’t even touch on, as well as some things that change from season to season. Things like our stonefly hatches, black ant falls and a number of other, ‘at times significant events’, that most people won’t encounter. If you should need flies for an upcoming visit feel free to order a fly pack from our online shop or stop by the shop for some flies, a mud map and up to the minute advice from our staff of guides. Sing out if you have any questions. You can reach us in the shop any time on 03 5773 2513 or on my mobile 0418 995 611 and of course we are available for guiding, tuition and/or drift boat trips every single day of the season.